If you are a blogger or creator of any kind, you know how important it is to be putting out regular content. Learn how to schedule quality blog posts with our simple plan. If you are a blogger or creator of any kind, you know how important it is to be putting out regular content. Your readers want to hear from you, so interacting with them on a regular basis is a big priority. Not only does this increase your website's or blog's page views, it creates trust with your readers. This is especially important if you want to pitch them a new product down the line. Your readers and future customers need to know, like, and trust you before they will be willing to pull out their wallets. So if we all know how important consistent communication is, why do so many of us drop the ball? Usually it is from a lack of planning. When you start a blog, you are full of excitement and inspiration. It feels easy to start blogging a few times per week, but then life intervenes or your child becomes sick and suddenly you can't keep up with this pace. The best way to ensure consistent content is to develop an editorial calendar. This is basically just a schedule of what blog posts or newsletters are going out and when. Here is our 5-step guide to rocking your editorial calendar for the year. This might sound too basic, but knowing your audience is the most important step. Knowing your readers' hopes, dreams, and fears will help you develop content that they'll love to read. This will keep them coming back week after week. Make a list of all the characteristics of your ideal reader and be as specific as possible. Instead of targeting stay-at-home moms, think stay-at-home moms in their early 30's with young children who enjoy traveling, reading novels, and going out for Thai food with friends. See how different that feels? Now that you know your ideal reader, start brainstorming topics they'd love to read about. If you are a food blogger, make a list of recipes and complementary topics. Maybe you could incorporate some restaurant reviews or gardening tips. Try not to edit yourself; just write down as many ideas as you can. 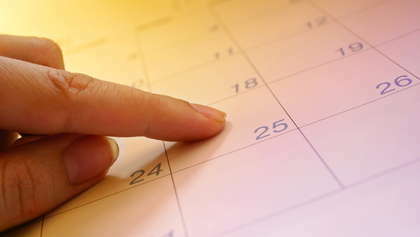 Now that you have your list, start scheduling your posts. Decide what day of the week you'll be releasing your posts and how often. If you don't feel like you have a lot of time, start with one per month or every other week. It is better to start slow and build up, rather than to burn out. Then just start copy and pasting your topics into your calendar. Now that you have a basic editorial calendar, make sure you fill in all the seasonal topics you want to cover. If you are a mommy blogger, you will probably want to do a back-to-school post at the end of August. Go through your year and think about any special content you'll want to share. Take a deep breath, because you just made a beautiful editorial calendar! Now comes the hardest part - sticking to your calendar. Try scheduling in writing time, so you know exactly when you'll be creating this new content. If you fall off the wagon for a few weeks, don't give up. Just pick up where you left off and you will have a big, gorgeous portfolio is no time!